Peanut Butter Wolf, Egyptian Lover & Jimi Hey (Dublab) will be spinning at The Music Center, 135 N Grand Ave, Los Angeles, CA from 7pm-11pm. Come dancing…All ages! 1984 was the year for me. I had just become a teenager and thanks to songs like “Rockit”and “Buffalo Gals”, I was learning about DJing and scratching and was inspired to get my first turntables and a DJ mixer from Radio Shack for my 14th birthday. I didn’t even really care about mixing so much. I’d spend hours just “scratching” records, this thing I just learned about. I didn’t know there was such a thing as a slipmat and so the other side of my “Rockit” record that was my go-to record got ruined by me scratching with it for hours on end. I didn’t know that the “fresh” sound from “Rockit” that everyone scratched with was really from a record called “Change The Beat”, nor did I know that Fab 5 Freddy was the one who said “Aweee, this stuff is really fresh” through the vocoder. I didn’t know anything other than I wanted to mix and scratch. Before that, I was doing pause tapes with the tape deck, but now I could actually play 2 songs at the same time and mix and scratch with them. This was a huge deal. I didn’t know anybody my age who had a mixer or 2 turntables. Hell, I didn’t even personally know any adults who had that. I only learned about it from watching movies like “Breakin” at the movie theater and “The Wildstyle” on VHS and through a very select few music videos and from hearing other DJs “mix” records on mix tapes and on radio station KSOL. 1984 was the year that hip hop became more than just a “New York thing” to me and people in the west coast were creating their own version of it (including me in my bedroom in San Jose, CA). There was now such a thing as “West Coast hip hop” thanks to records like “Reckless” by Ice T and Chris “The Glove Taylor”, “Techno Scratch” by Knights Of The Turntable, and “Dial A Freak” by Egyptian Lover. Pop locking and break dancing had just started to become national news and my friend Steve and I would sit by the TV and wait every Friday night for the cool videos with break dancing to come on the cable access show “Magic Number Video” so we could record them to VHS. Videos like “Party Train” by The Gap Band and “Save The Overtime For Me” by Gladys Knight & The Pips were the well known artists who incorporated break dance, but there were lesser known ones like “Get Tough” by CD III, “We Are The Jonzun Crew” by The Jonzun Crew, “Beats & Rhymes” by UTFO, “Street Dance” by Break Machine and “Smile” by Will Powers that we were excited to discover. There was no internet to instantly watch a video you liked over and over instantly. Had to put in the work. My DJ influences at the time were Afrika Bambaataa, Charlie Chase, Grandmaster Flash, and Grandmixer DST on the East Coast and Egyptian Lover, Chris “The Glove” Taylor, Knights Of The Turntable, and Dr Dre on the West Coast. East Coast hip hop was slower thanks to songs like “The Message” (around 100 BPM) and west coast hip hop was faster (around 125 BPM) and was more influenced by the electro that NY artists were making years before so I’d make mix tapes where one side was west coast and the other side was east coast. And in 1984, 3 movies came out that featured DJs, MCs, breakdancing, and graffiti. Instead of just listening to hip hop, I actually got to experience it in its full context. Hip hop and especially breakdancing were everywhere, from Michael Jackson and Lionel Richie music videos to the Olympics, which happened to be held in Los Angeles in 1984. We’d even video tape the TV commercials that included breakdancing like Mt Dew and Sprite. This underground music that I had been following since 1979, was now showing up on Late Night with David Letterman and I also remember seeing people break dance for the Pope. 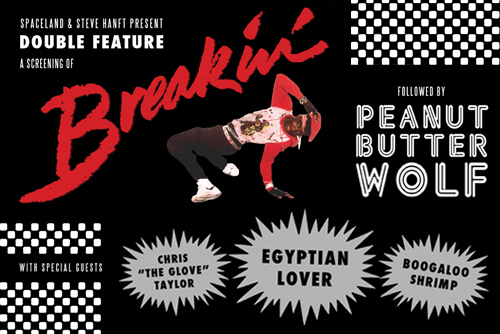 When I was asked by Steve Hanft to chose a film that influenced me to DJ after for his Double Feature series, I had to go with Breakin’. It was kinda a no-brainer because of the influence it had on me as a teenager. Sure, the acting and the plot are pretty bad (even Ice T is embarrassed of his part in the film and disses it publicly). It kind of probably even contributed to East Coast people turning their nose up at West Coasters in hip hop, which is important to note if you really wanna dissect the east coast/west coast beef that eventually escalated to Biggie and 2Pac. But I watched Breakin’ to learn about hip hop music and hip hop dance. Not the acting. Of course, The Wildstyle, Grafitti Rock, and even Beat Street are more “legit” for hip hop purists, but Breakin’ is more relevant to LOS ANGELES old school hip hop and that’s another reason I chose it. It doesn’t hurt that I personally now know Egyptian Lover, Chris “The Glove” Taylor, and Boogaloo Shrimp, so I hit them all up and asked them each if they’d be down to share the stage with me and got their blessings. These are the kinds “dream come true” shows that literally have me tearing up while typing (emo alert, I know), but needless to say, I’m patiently awaiting Sunday, May 17th and thankful to the other talent on the bill for teaching me back then and participating with me in this screening/after-party now. And thankful to Steve Hanft for giving me a platform to do something I don’t get to do every day. Oh yeah, and I’ll be playing all the electro/hip hop music videos from 1984 that inspired me to do what I’ve made a career out of for over 20 years now.